Obituary for Rev. Dr. Cardinal Lester Collymore, Sr. | Frank R. Bell Funeral Home, Inc.
Rev. Dr. Cardinal Lester Collymore, Sr.
On July 26, 1936, Elder Dr. Cardinal Collymore, Sr. was born to the late Delcina Blackman Collymore and Garnett Collymore in the St. Andrew Parr is h of Barbados. He was the 15th of 18 children. Dr. Collymore attended the St. Andrew Primary Boys School. He was a very adventurous] child. Before school, his mornings consisted of tending to the cattle and sheep, milking the cows and watching the chickens graze the fields. His hobbies included fishing, tossing rocks in the water, to watch the waves jump, and a friendly game of cricket. A devout lover of reading, you could always find young Cardinal engaged in all types of literature. He was a very ambitious young scholar and was eager to further his knowledge in higher education. To further his education, Dr. Collymore attended trade school where he took up carpentry. He later worked at the Senior Sugar Factory as an engineer. Great with his hands, he became a master at his trade and went on in the career of Engineering. In 1959, Dr. Collymore arrived in the United States of America. His ministry began in 1960 where he affiliated with United Holiness Church, (Brooklyn, New York). He later attended the Manhattan Bible Institute to pursue his education in ministry. Dr. Collymore met his wife, Josephine Armstrong in 1962 and from that union were born two children; Cardinal Lester Collymore, Jr. and Robin Simone Collymore. In 1967. Dr. Collymore worked as cleaner with the Department of Education. He later worked as a Fireman Engineer until retirement. While working at Sands Junior High School, Dr. Collymore was acquainted with Dr. Clarence Cooper. There they worked side by side on the job and later in ministry. 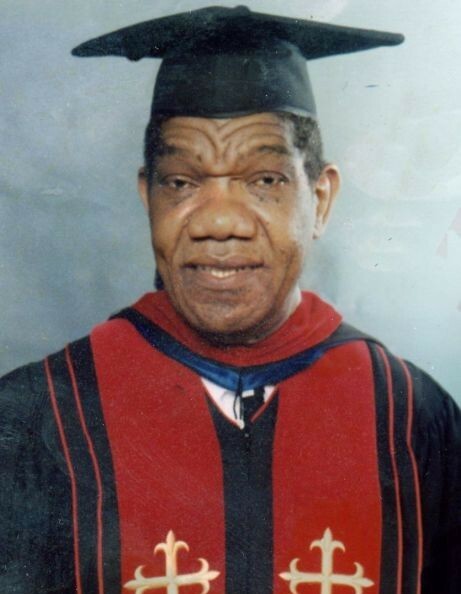 In the 1970's, Dr. Collymore became a teacher of Theology, under the leadership of the late CR Johnson in Brooklyn, NY. In 1974, he taught at the Tabernacle Bible Institute located in Jamaica, Queens under the leadership of Apostle Johnny Washington. In his down time, Dr. Collymore enjoyed teaching and tutoring his students in the Word of God. For a short time, he attended Holy Ghost Tabernacle (Brooklyn, NY) under the leadership of Elder C. Weeks, until his sister-in-law (Kay Blackman) heard the call of pastorialship over his life. Dr. Collymore later joined and[ diligently worked side by side with her in ministry singing praises and preaching God's word. He then furthered his ministry alongside longtime friend Dr. Clarence Cooper. Dr. Collymore served under Dr. Cooper until death. He worked as the Sunday Superintendent, the President of the Building Fund and dedicated Assistant Pastor to the ministry. Elder Dr. Cardinal Collymore, Sr. loved his family and the quality time spent with his children and grandchildren. He enjoyed taking his children fishing, apple picking and taking occasional trips to the island of Barbados. Family outings consisted of picnics, bike riding and of course church. He also enjoyed watching wrestling, engaging in family sing-along's, and playing his harmonica. Dr. Collymore's love for the Word of God was so rich that his children developed a desire to study and further their education in ministry just the same. Dr. Collymore leaves to cherish his memory five siblings: two brothers Michael Collymore and Delbert Murray and three sisters Euynice Murray, Ruby Murray and Lorraine Murray. Two sister-in-laws; Sarah Hickman and Eleanor Armstrong. His wife; Josephine Armstrong-Collymore, his children; Cardinal L. Collymore, Jr. and Robin Simone Collymore-Pass. One son in law; Ronald Pass. Five grandchildren; Terrance, Aaron, Andre, Jenesia, and Isaiah. Nine great-grandchildren; Tenasia, Angelie, Hailey, Adonis, Alivia, Ayiana, Kaleb, Ayala and Chy'anni. A special niece; Linda Carter. A special cousin; Pearl Blackman. A devoted friend and sister; Pastor Martha Anderson and host of nieces, nephews, cousins and friends and the Zion of Faith Missionary Baptist church family.